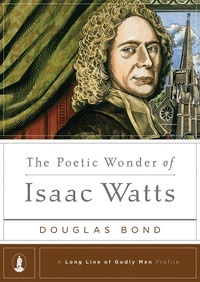 Please forgive the long review, but I’d been looking forward to getting ahold of a copy The Poetic Wonder of Isaac Watts since I heard about the book about a month ago; I jumped in right away, and devoured it pretty quickly. It turned out to really be a 50/50 mix between a book that’s very necessary for our times, and a book that could’ve been, and (maybe) should’ve been more. But what I kept coming back to was this: Bond sets out to do something very specific with this volume, which is part of the larger “Long Line of Godly Men Profiles” (Steve Lawson, editor). It’s a book that has to be appreciated on its own terms, and for the purposes for which it was written. Ultimately, it’s a very good introduction to Isaac Watts’s life and work, and even more significantly, has much to say to both worshipers and worship leaders in the Western church. Bond’s volume on Watts serves up equal parts biography, theological analysis, and overview of Watts’s major works and their significance. Bond does a decent job combining these three elements, which is no easy task in a fairly short, 163 page book (about the usual length of books in the “Long Line of Godly Men” series). But in spite of being brief, this book does a good job of giving us a good bit of everything. We learn the story of Watts’ early life and spiritual formation, how he came to develop his poetic gifts, and how God grew Watts’ convictions for church music and congregational song. I would’ve loved for the book to dive even more into Watts’ pastoral care of his congregation, and more of how we see that care employed in his songwriting. But again, that kind of detail might fit better in a longer book. “Our world clambers for the latest thing ,and as we wear ourselves out in the process, great poets such as Watts often get put in a box on the curb for the thrift store pickup. How could a gawky, male poet, living and writing three hundred years ago, be relevant today? Our postmodern, post-Christian, post-biblical culture has almost totally dismissed what was called poetry in Watts’ day. Few deny it: ours is a post-poetry culture” (xix). In one of the most rich and valuable parts of the book, Bond goes on in the preface to compare Watts, who held to poetic form and structure, to Walt Whitman, the father of “vers libre” or free-verse poetry. The contrast is compelling because Bond points out that Whitman abandoned form, which was part and parcel of making himself his life’s object of worship; whereas Watts, writing poetry and hymns in rhythm and meter, sought to exalt Jesus Christ and make him look glorious. Underlying either the use of form, or the abandonment of it, is often a question of worship. And yet, Watts avoided “‘excess baggage of intricate form as well as of poetic adornment.’ His was a gospel objective first and last” (xxiii). The pastoral purpose that often constrained Watts’ overuse of “poetic adornment” is what makes his hymns so good for church song leaders and song writers to learn from today. He faithfully employed his creative gifting and skill for his people, taking Scripture and a robust biblical theology and writing a hymn a week for his church, as a vehicle for them to connect heart and imagination to their theology. Contemporary church culture has often valued hit records and radio play as the marks of worship music success, and we should remember men like Watts who wrote his hymns week-in and week-out with a pastoral purpose. He did this faithfully, without hope of reaching beyond the congregation he pastored. But his hymns did reach beyond that context, and we bless God for it. One more benefit of the book for a worship leader in particular, is for the exposure to Watts’ poetry. Bond spends the last chapter giving an overview and explication of several of Watts’ best hymns, including a mix of both popular, and seldom sung choices. For instance, Bond takes us stanza-by-stanza through both “Joy to the World” which most readers know already, and “Jesus Shall Reign” which might be a little more obscure to many, depending. The poetry analysis is very helpful, but it does fall a little short in places. It errs on the side of very light analysis at times, risking summary of the poem rather than analysis of what makes it so great, which is more what I think Bond is going for in this section. But, in the best sections, the analysis is good and detailed, and does effectively present the quality of Watts’ imaginative expression, precision of structure, and richness of biblical content. Douglas Bond has clearly done his research to get to know Watts’ life and work. He loves the poetry of this great hymn writer, and draws us into his own enjoyment of it. The book is a very good smaller biography and a hub of resources on Watts, especially good to put in the hands of church musicians, music leaders, and songwriters. I hope church music and worship folk do get their hands on it and that it edifies and inspires. “As we flounder about in the ‘liturgical fidget’ of the contemporary church, Watts can provide both the theological and liturgical ballast Christian worship so desperately needs. And he can give us an emotional rudder, a means of steering the passions in worship by objective propositional truth feelingly delivered. Without such a rudder, worship is shipwrecked on the shoals of cheap-trick emotionalism generated in much the same way it is at a concert or a football game. Tragically, in place of singing psalms, hymns, and spiritual songs in worship to Jesus Christ (Col. 1:16-17), raw feelings of having done so may be supplanting the real thing” (134). Let’s not just return to singing the hymns of Watts or any other songwriters from church history. Let’s study and sing the best of their work, and also look to freshly do what they did, writing and choosing songs with pastoral care for our churches. * Many thanks to Reformation Trust Publishing for providing a complimentary copy of the book in exchange for an unbiased review.